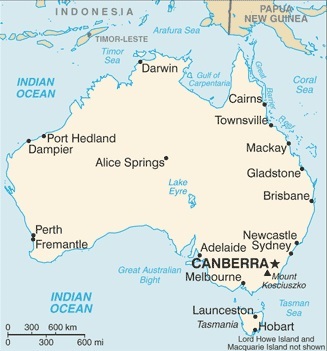 The Commonwealth of Australia is a large country, principally located in a large island continent (and covering the entire mainland of that continent) in the Southern hemisphere, but also incorporating a number of additional islands as well, including islands that in the Indian, Pacific, and Southern Oceans. The largest of these Australian islands is Tasmania, which lies to the Southeast of the mainland Australian continent, just 125 miles (200 kilometers) away, across the Bass Strait. Australia does not have any land borders with any countries, but it does have sea borders which a number of countries, specifically Indonesia, New Caledonia, New Zealand, Papua New Guinea, the Solomon Islands, Timor-Leste, and Vanuatu. The population of Australia is currently approximately 21 million people. Most of these people live in the various capital cities of each of the five mainland Australian states: Adelaide (capital of South Australia), Brisbane (capital of Queensland), Melbourne (capital of Victoria), Perth (capital of Western Australia), and Sydney (capital of New South Wales). There also of course many other cities in Australia, including the national capital, Canberra. Australia has a developed economy, and is one of the world's top 20 countries in terms of both overall GDP and GDP per capita. The economy is dominated by a service sector, which accounts for approximately 70% of GDP. However, although agriculture and mining are relatively small in absolute terms (less than 10% combined), they dominate Australia's exports. Australia is home to a wide range of different climatic regions and habitats. Most of the country is covered by desert and semi-arid grasslands, but there are also temperate zones, tropical and subtropical regions, and some equitorial climatic regions. There is a great diversity in the flora and fauna found across the country, and many distinctive forms of wildlife for which Australia is known, such as emus, kangeroos, koalas, kookaburras, playtpus, and wallabies. Additionally, Australia also is home to the world's largest coral reef system, the Great Barrier Reef, which is over 1,600 miles (2,600 kilometers) long. If visiting Australia, you will of course want to see the wildlife, the Great Barrier Reef, the beaches, the natural landscapes (such as Ayers Rock - Uluru), and the country's many cosmopolitan cities. 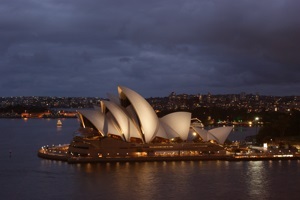 Australia teems with cultural and natural treasures. Its diverse habitats are home to countless strange and amazing creatures, while its extensive coastlines include a wealth of beautiful beaches. With color photos throughout, Fodor's Essential Australia captures the country's stunning diversity, from vineyards to Outback adventures, from hikes through Tasmania to fine dining in Sydney, from tropical rainforests to majestic underwater reefs. Lonely Planet Australia is your passport to the most relevant, up-to-date advice on what to see and skip, and what hidden discoveries await you. Cruise magnificent Sydney Harbour, grab a coffee in a Melbourne laneway or head off on an outback adventure; all with your trusted travel companion. Get to the heart of Australia and begin your journey now! Cultural insights give you a richer, more rewarding travel experience - history, politics, Aboriginal Australia, environment, landscapes, wildlife, cuisine, wine, sports, outdoor activities. The Perfect Choice: Lonely Planet Australia, our most comprehensive guide to Australia, is perfect for both exploring top sights and taking roads less travelled. Looking for Australian road trip ideas? Check out Lonely Planet Australia's Best Trips. Whether you want to climb the Sydney harbor bridge, ride the perfect wave at Bondi Beach, watch the sun set over Ayers Rock, or stroll the cosmopolitan streets of Melbourne, this guide is your ultimate travel companion. The best places to visit in Australia are showcased with fantastic photography and detailed descriptions, plus DK's unique illustrations and floor plans. Packed with valuable insider information such as Sydney's best beaches and Melbourne's buzzing shopping districts, along with a wealth of practical tips including hotel and restaurant listings, transportation maps, suggested itineraries, and tours of unmissable sights, DK Eyewitness Travel Guide: Australia is the only guide you'll need. With hundreds of full-color photographs, hand-drawn illustrations, and custom maps that illuminate every page, DK Eyewitness Travel Guide: Australia truly shows you this city as no one else can. Lonely Planet Discover Australia is your passport to Australia's top sights and most authentic experiences. Explore magnificent Sydney Harbour, see the Great Barrier Reef or watch the sunset at Uluru, all with your trusted travel companion. Offering visually-inspiring content along with the most relevant, up-to-date advice on what to see and skip, and what hidden discoveries await you, this photo-rich, user-friendly guide makes planning fun and easy. Discover the best of Australia and begin your journey now! The Perfect Choice: Lonely Planet Discover Australia , our easy-to-use, expertly curated guide, is filled with inspiring and colorful photos and focuses on the destinations' most popular attractions and authentic experiences for those looking for the best of the best and have minimal time for planning. Active travelers trust National Geographic to deliver what they want in a guidebook: expert advice, insider tips, and the cultural feel of each destination not easily found online. These guides are pitch-perfect for today's experiential travel enthusiasts who want an authentic, enriching immersion. From famous Bondi beach in Sydney to massive Ayers Rock in the remote desert outback, from rough-and-tumble gold-mining towns in Australia's Far West to the incredible underwater vistas of the Great Barrier Reef, Oz expert Roff Smith guides you through the incredibly varied land- and cityscapes that are modern Australia. Illustrated with 175 vivid photographs and nearly 30 detailed, full-color maps, this guide gives you every tool you need to plan a trip to the unique land on the other side of the world. Starting with a detailed introduction to Australia's history, food, land, and culture, the book explores every corner of the country beginning with Sydney, the gleaming cosmopolitan jewel in New South Wales. Special sidebars give detailed information on many topics such as Australian wine, cricket, bush fires, aborginal art, and the many cultural festivals of southern Australia. The book features seven guided drives through some of the land's more spectacular scenery and numerous guided walks in Sydney and Melbourne. A thorough Travelwise section recommends hotels and restaurants throughout the country in all price ranges. The book is chock-full of insider tips from National Geographic and local experts to favorite or little-known sites and events, as well as dozens of sidebars highlighting experiences such as wading among curious wild dolphins off the western coast, camel trekking in the outback desert, and diving among giant clams and vivid coral at the Great Barrier Reef. Whether you're visiting the lush forests and wildflowers of the Snowy Mountains, fishing for trout in the rivers of Tasmania, or taking in a concert at Sydney's world-famous Opera House, this guide has everything you need for a memorable trip. Everything you need for a successful Australian vacation―in one intelligent guide. The Australian dollar has recently plunged in value against the U.S. dollar making Australia far more accessible than it has been in years. To keep up with the changes the new currency situation has brought about, we’ve turned once again to Lee Mylne. Based in Brisbane (the third most populous city in Australia), Mylne has been an Australian travel journalist for nearly all her working life. She has crisscrossed every state and territory of Australia by every means of transport, and she is a life member and past president of the Australian Society of Travel Writers. There’s a reason that Frommer’s has been the most trusted name in travel for more than sixty years. Arthur Frommer created the best-selling guide series in 1957 to help American servicemen fulfill their dreams of travel in Europe, and since then, we have published thousands of titles became a household name helping millions upon millions of people realize their own dreams of seeing our planet. Travel is easy with Frommer’s. to quickly help you find your way when planning and organising your trip in Australia. 7. The Author's advice - You can get in touch with the author if you have any question with regards to your Australia Trip. Discover the freedom of open roads while touring Australia with Lonely Planet Australia's Best Trips, your passport to uniquely encountering the country by car. Featuring 39 amazing road trips, from 2-day escapes to 2-week adventures on which you can experience the world-class surf beaches and iconic landforms of Victoria's Great Ocean Road, the epic big skies and forever horizons of the Nullarbor Plain, and more; all with your trusted travel companion. Hit the road! The Perfect Choice: Whether exploring your own backyard or somewhere new, Lonely Planet Australia's Best Trips is perfect for exploring Australia via the road and discovering sights that are more accessible by car. Looking for a road trip guide to a particular Australian region? Check out Lonely Planet's Road Trips guides to Coastal Victoria, Tasmania, and Outback Australia. Planning an Australia trip sans car? Lonely Planet Australia, our most comprehensive guide to Australia, is perfect for exploring both top sights and lesser-known gems, or check out Discover Australia, a photo-rich guide to the country's most popular attractions. Looking for a guide focused on a specific Australian city? Check out Lonely Planet's guides to Sydney or Melbourne & Victoria for a comprehensive look at all these cities have to offer, or Pocket Sydney or Pocket Melbourne, handy-sized guides focused on the can't-miss sights for a quick trip. Ready to experience Australia? The experts at Fodor’s are here to help. Fodor’s Essential Australia travel guide is packed with customizable itineraries with top recommendations, detailed maps of Australia, and exclusive tips from locals. Whether you want to dive the Great Barrier Reef, scale the Sydney Harbour Bridge, sail the Whitsunday Islands, or explore Aboriginal art in Uluru-Kata Tjuta National Park, this up-to-date guidebook will help you plan it all out. • AN ULTIMATE EXPERIENCE GUIDE that visually captures the top highlights of Australia. • SPECTACULAR COLOR PHOTOS AND FEATURES throughout, including special features on diving the Great Barrier Reef, understanding Aboriginal Art, hiking in the Blue Mountains, driving the Convict Trail in Tasmania, and exploring Australia’s renowned wine regions. • INSPIRATIONAL “BEST OF” LISTS that identify the best things to see, do, eat, drink, and more. • MULTIPLE ITINERARIES for various trip lengths to help you maximize your time. • MORE THAN 70 DETAILED MAPS AND A FREE PULLOUT MAP to help you plot your itinerary and navigate confidently. • EXPERT RECOMMENDATIONS ON HOTELS AND RESTAURANTS with options for every taste. • TRIP PLANNING TOOLS AND PRACTICAL TIPS including guides to getting around, saving money and time, beating the crowds; and a calendar of festivals and events. • LOCAL INSIDER ADVICE on where to find under-the-radar gems including: Western Australia’s Best Beaches, Tasmania’s Top Hikes, 10 Unique Places to Stay, and 20 Things to Eat and Drink in Australia. •HISTORICAL AND CULTURAL OVERVIEWS to add perspective and enrich your travels. • COVERS: Sydney, New South Wales, Melbourne, Victoria, Tasmania, Brisbane, Adelaide, the Northern Territory, Perth, and Western Australia and includes the Great Barrier Reef, the Blue Mountains National Park, the Gold Coast, Uluru-Kata Tjuta National Park, Bondi Beach, Daintree National Park, Cairns, and more. Planning on visiting New Zealand? Check out Fodor’s Essential New Zealand.